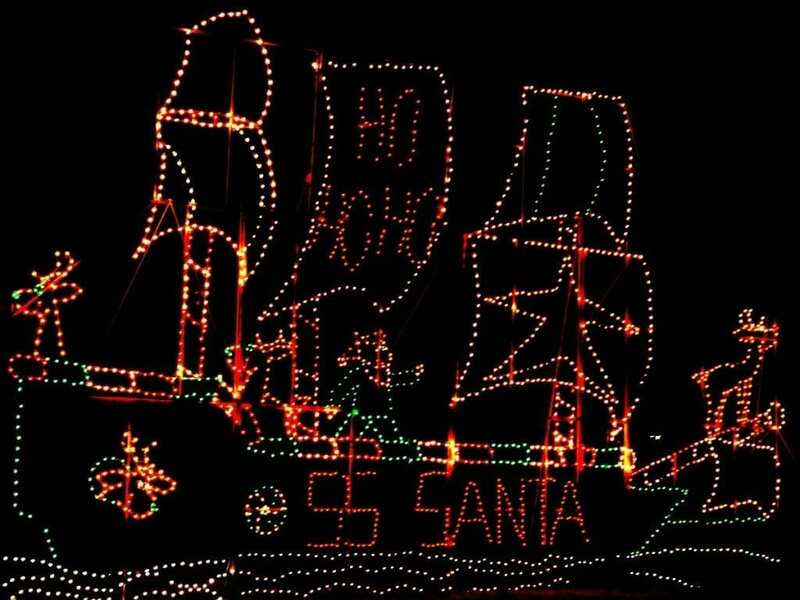 Santa Claus’s ship sets sail at Krodel Park at Point Pleasant, W.Va.
Three holiday light displays near Point Pleasant, West Virginia, are attracting sightseers to one of the most scenic sections of the Ohio River valley. Exhibits at Point Pleasant’s Krodel Park, at the West Virginia Farm Museum, and at Gallipolis City Park in Gallipolis, Ohio, have become part of the circuit of displays favored for their variety. All are open to the enjoyment of guests free of charge (though contributions are welcomed) and each has its own particular appeal, according to Dennis Bellamy, director of the Mason County Convention and Visitor Bureau. 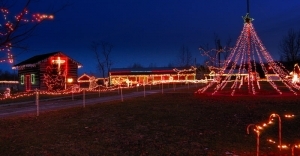 All three will be open December 7-16 when the farm museum display is lighted, otherwise two displays at Krodel Park and Gallipolis will be lighted nightly through Dec. 31. Dusk falls at W.Va. Farm Museum. 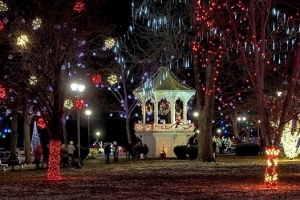 “The Krodel Park displays are animated, the lights at the state farm museum enhance the farm buildings and machinery there, and the lights at Gallipolis build on the park’s outstanding historical character,” Bellamy said. “An evening’s visit to all three has become a kind of annual pilgrimage for many people as it’s only about an hour’s drive from Charleston, Parkersburg, and Huntington,” he said. Drive thrrough Krodel Park with more than million lights and 20 animated LED light displays. Stroll through the historic park amid millions of lights, 216 community trees, and 1,800 lighted ornaments. Photo op sites and special events such as a live nativity are highlights. Includes ore than a million lights covering every cabin and machinery displayed. Santa is on hand for pictures, and free hot chocolate and cookies are available for kids nightly. For more information, contact the Mason County Convention and Visitors Bureau.